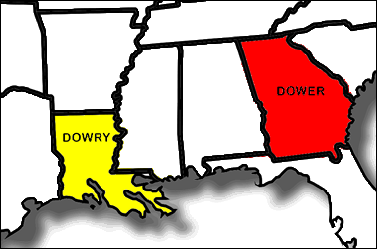 Reader Miriam D. has ancestors from all over the American south and, as a result, is struggling to understand the differences that sometime crop up between jurisdictions. And right now what has her confused is the difference between dower and dowery (or dowry — you’ll see it spelled both ways). Because what Miriam has here is more than just a difference of one letter — it’s a difference in entire legal systems, giving rise to entirely different concepts, different expectations and different records that result. In both cases, the words refer to some property — land, money, rights of some kind — going from one party to another as the result of marriage. But because of the different underlying legal systems, the property rights are going in different directions. Under that English common law, a wife’s dower was her right, on her husband’s death, to enough of his estate to support herself and her children. In most jurisdictions, she had the right to live on and get the profits from one third of his land during her lifetime plus some percentage of his personal property. After her death, the lands would go to their children (or to his heirs if there were no children); the widow didn’t have the right to sell or will the property away. So you’ll see all sorts of records, in Miriam’s Georgia case and throughout the former English colonies, setting side dower for widows and resolving issues that came up because of dower rights. Under the civil law, then, the records will be very different: there will be marriage contracts and records of agreements drawn up by notaries public (who played a much more significant role under civil law systems than they did in common law jurisdictions), and Miriam will see outcomes in her Louisiana cases that don’t look much like what she’ll see in Georgia. Two words so very similar, two legal concepts — and legal systems — so very different. And a great example of how knowing the law lets us understand the records. And so, a “dowager” (I’m think Downton Abbey, here) is a woman with a life estate, or dower, (under English common law) in her deceased spouse’s lands? That’s one common meaning, yes. It’s also used, of course, to distinguish the widow of a nobleman from the wife of the current title holder. The different status of dowry property and dower interest in property can have serious practical consequences. A distant cousin wrote her will in 1845 in what is now WV. She was a ‘grass widow’ (heheheheh). She bequeathed her land to three children born of her marriage, and personalty to a child born before her marriage (who was not described as such in the will). Her father devised land on which she lived to her in his 1831 will, and father and mother had conveyed adjacent land to her in 1824. She had purchased another tract herself in 1830. When brought for probate in the Court of Common Pleas in 1853, the Court initially refused to accept it on the basis that the property was that of her husband, and she had no right to devise it by will. In this interpretation, she would be treated as widow of a person who died intestate, her dower interest extinguished by her death, and the property would be treated as if her husband had died intestate — divided equally among the four children. The children devised land sued to have the will probated as written, explaining that the husband had left in 1819 and not heard from since, so presumed dead, so their mother should not be considered femme couverte; that the husband had never treated the first child as his own; that the land bequeathed in the will was the testator’s own, acquired from her father and by her own industry. The Court accepted this explanatory Bill of Complaint as written — and it was very helpful that the father’s will and the deeds to my cousin were all well and clearly recorded in the same county’s records. The will was admitted to probate, and title to the lands vested in the three children of the marriage. Very good and interesting example! Thank you for the clear explanation of the difference between dower and dowery/dowry and that they derived from different legal systems. I have some research ongoing with people resident in Quebec between 1775 and 1880 as well as another group from New York and Pennsylvania. It explains why the women were dealt with differently which was not apparent from the records I had found.